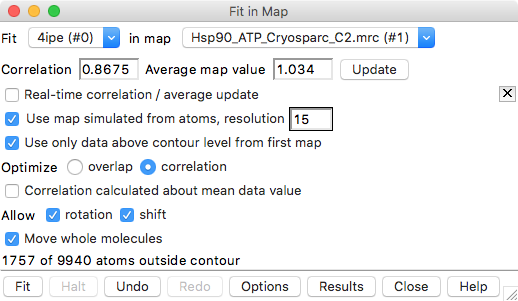 How to dock an HSP90 atomic model (x-ray) into a low resolution (~20 Angstrom) negative stain electron microscopy single-particle map using UCSF Chimera version 1.12. 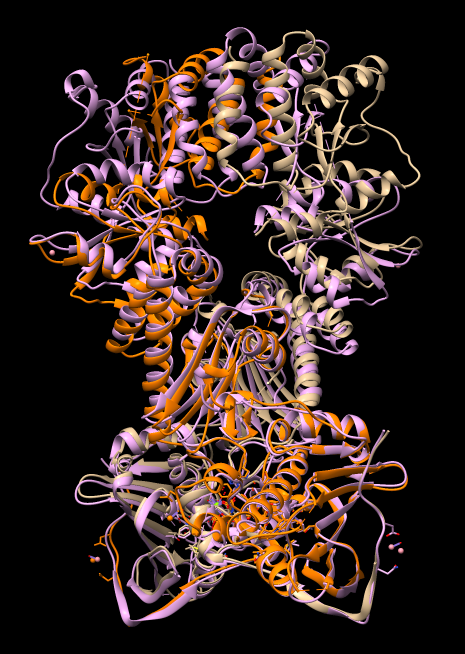 Open HSP90 protein, PDB 4ipe File / Fetch by ID. Select chain A Select / Chain / A. Color chain A orange Actions / Color / Orange. Clear selection Ctrl-click on background. Adjust map surface threshold Volume Viewer panel, move vertical bar on histogram. Freeze map motion Favorites / Model Panel. Click active button (column headed by "A") off for map. Hand dock model Drag atomic model into map with mouse. Unfreeze map Click active button in Model Panel for map. Optimize fit Tools / Volume Data / Fit in Map. Press Fit button on Fit in Map panel. Make surface transparent Press Volume Viewer panel color button, click opacity, change A (opacity) value. Show simulated map. In Model Panel check button in S (show) column for molmap 4ipe res 15. Correlation values compare two maps and range from -1 to 1, with 0 indicating no correspondence, and 1 identical maps. Is the Atomic Model Dimer Symmetric? Notice that atomic model pokes out of map surface in an asymmetric way, the helices and turns of the two chains that poke out do not match. Why? Is the 4ipe atomic model symmetric? Open second copy of 4ipe Press lightning bolt icon in lower right corner, click 4ipe button. with chain A of other 4ipe Tools / Structure Comparison / Matchmaker. Chain pairing: specific chains with specific chains. Reference chain #0 A, match #2 B. 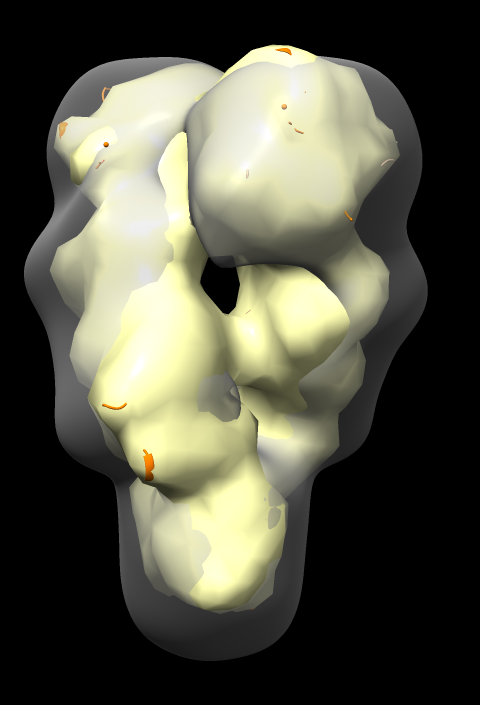 Note the N-terminal domains align well but the C-terminal domains misalign by more than 10 Angstroms. Is the map C2 symmetric? 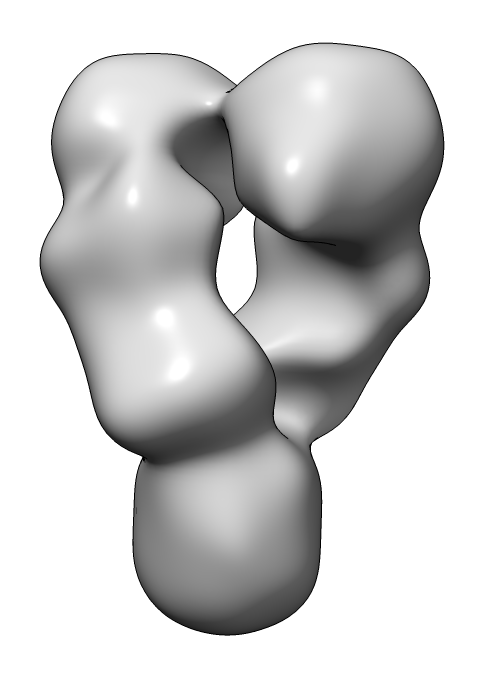 Map single-particle reconstruction imposed C2 symmetry. But let's check that it really has C2 symmetry. Open second copy of map Press lightning bolt icon in lower right corner, click Hsp90_ATP_Cryosparc_C2.mrc button. Hand align map copy to original map Click line in Model Panel for map copy, press Activate Only button. Move map copy with mouse to align with original copy. Press Activate All button. Tools / Volume Data / Fit in Map. Use Model Panel to activate only map copy, approximately hand rotate 180 degrees. Press Fit button. Note correlation coefficient is 1 for map fit into map even after 180 degree rotation. 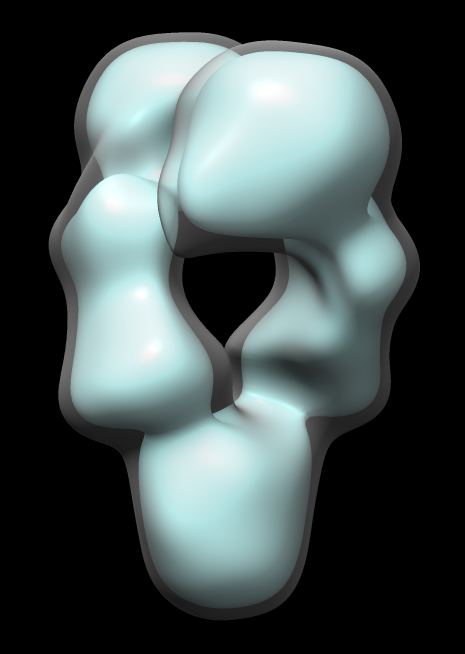 Has exact 2-fold (C2) symmetry. 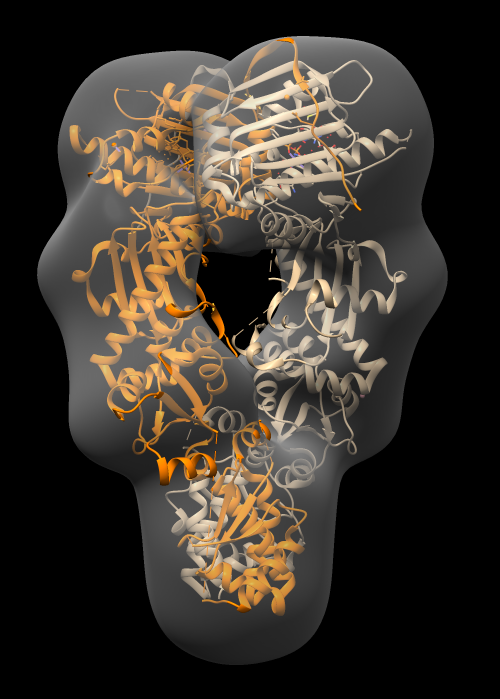 Are other HSP90 atomic models symmetric? 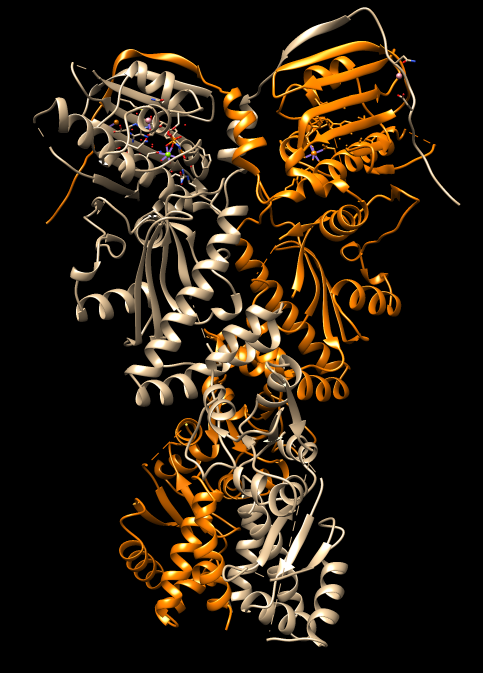 Do other HSP90 atomic dimer models have symmetry? 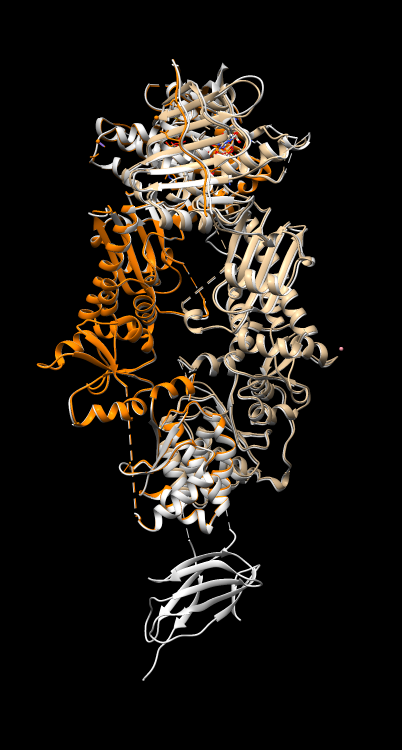 Align another PDB HSP90 model 5tth to 4ipe to see how similar they are. Align 5tth to 4ipe Tools / Structure Comparison / Matchmaker. Reference 4ipe chain A, match 5tth chain B.
Visually 4ipe is nearly identical to 5tth except the latter has an extra domain. The reply log reports 0.464 Angstroms root mean square deviation (C-alpha atoms) for 587 paired residues. Can find 348 other PDB structures with high sequence similarity (BLAST E-value < 1e-38) using menu Tools / Sequence / Blast Protein. Can select some or all and press "Load" to load them and automaticallly align them.